I am remembering Sgt. Brandt today. He was a incredibly humble and hardworking officer. His loss has left a wound in the Fairbanks community and in the law enforcement family that will never heal. We can only hope to honor his legacy by seeking to follow his example of professionalism. Gone but never forgotten. Rest In Peace Brother. We remember and honor you on the 1st anniversary of your E.O.W. Prayers for you, your family and coworkers. Sgt. Brandt was my brother. The first shot which blinded Allen occurred before the shooter dashed in front of the car while the shooter was not visible to the dash camera. In the subsequent altercation, Allen was unable to see and could only react to what he heard. After Allen's vehicle was stolen, he dragged himself out of the street and immediately called in to the station. A nearby resident stood watch with Allen until help arrived. She told me that Allen was a consummate professional. He had not waited for backup before responding to the shots fired. The shooter had fired shots into at least one hotel room. Allen's practice was to be the first officer on the scene whenever innocent lives were in danger. Allen was the overnight watch commander and it was his call to go in alone. The Fairbanks police department has very few officers at night considering the size of the population. It is a different breed of person who runs toward danger instead of away from it to act as a shield of defense for others. God bless every police servant who, like Allen, is willing to lay down his life to save others. Allen was highly praised by his fellow officers and the community in which he served. At an address to the city council shortly after the shooting, he expressed that he had seen the hand of God in his situation. I can only pray for the shooter and that others come to a saving knowledge of Jesus as a result of this, as Allen strived to tell people about Jesus whenever possible. He was a great example of humility and grace. He leaves behind a wife and four children and will be greatly missed. God's peace and speed Sergeant Brandt. Thank you for your brave, dedicated service. RIP Brother. My prayers are with this brave young officer's family. May he rest in peace. May God watch over your family. You are in His hands now. RIP. Rest in Peace, Sergeant Allen Brandt. Thank you for your service to this country and your community. My thoughts and prayers are with your family and your department at this time. To the family Sergeant Allen Brandt, friends, Acting Police Chief Brad Johnson and the Fairbanks Police Department. a land of a midnight sun. where the Coho and the Sockeye run. a wilderness bidden to enter. for not all men will act civil. that some men are created evil. of men and women well seasoned. To serve and protect is their reason. was dispatched to a cold winter street. Sgt Brandt was just patrolling his beat. to determine the cause of such hate. wandering in the cold and the black. struck in both legs and chest. Blood now covered his once spotless vest. an angel of mercy to render aid. Despite egregious wounds, this would NOT be fatal. Today, Death, you will be stayed. like Sgt Brandt was going to survive. But fate, unfortunately, had other plans. And Sgt Brandt sadly died. after surgery to help fix his eyes. dedicated to protecting the night. shielded by the northern lights. 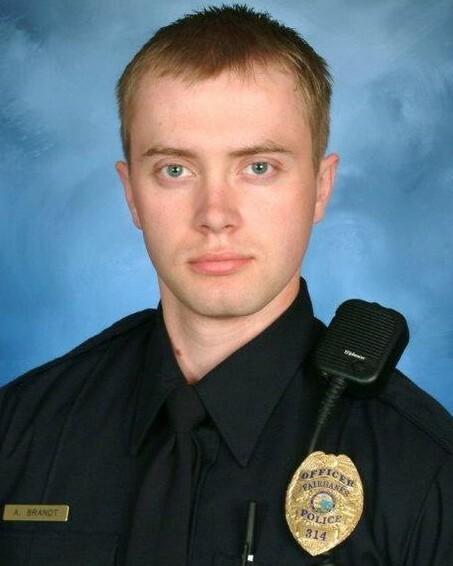 The Albany Police academy sends its deepest condolences to the Brandt family and the Fairbanks Police Department. Rest in Peace Sergeant Allen Brandt. RIP, we got it from here. RIP , we got it from here. RIP Sgt. Brandt. This is such a tragedy... My thoughts and prayers are with your family. Thank you for your service and impeccable courage. You've truly done Alaska proud. God bless you. Allen, remember meeting you at the funeral procession for Sgt Scott Johnson and Trooper Gabriel Rich on airport road waiting for them to pass by. After that we had a few run'ins on a few calls. I don't remember most of the FPD officers but you I do. Thank you for protecting the Golden Heart City. You are not forgotten.